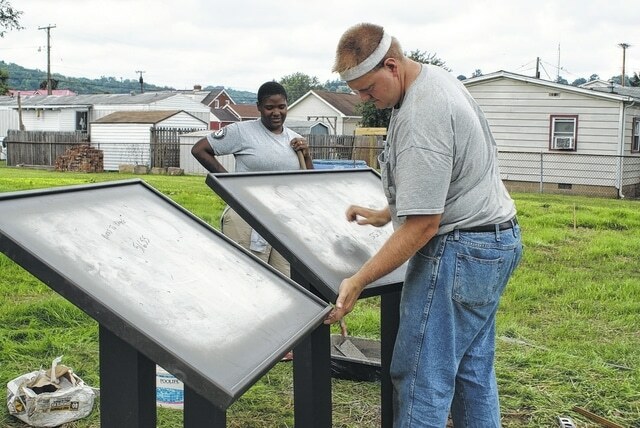 Jim Lee, an AmeriCorps member from Massachusetts, is shown as he stains a trellis that will be placed in the Virgil A. Lewis Memorial Reading Park in Mason. The trellis, made from 150-year-old oak from the former Lewis home, was constructed by members of Lawrence Gray’s shop class at the Mason County Vocational Center. Jim Flook, an AmeriCorps VISTA member, is pictured as he sets signs at the Virgil A. Lewis Memorial Reading Park on Brown Street in Mason. The park is set to open Friday, July 10, with a ribbon-cutting ceremony at 11 a.m. Also shown is Mishell Fields, an AmeriCorps member from New York. MASON — Work is progressing on a park in Mason that will be located on the former home site of a noted historian and author. The Virgil A. Lewis Memorial Reading Park is set to open on Brown Street following a ribbon cutting ceremony at 11 a.m. July 10. Along with local dignitaries, Joe Geiger, director of archives and history with the West Virginia Division of Culture and History, is expected to attend. Lewis was the first West Virginia state historian, a state superintendent of schools and an author of history books. The Mason House, where he lived for nearly 20 years, was recently razed due to its deterioration. Being completed as a part of the Rivers to Ridges Heritage Trail, the park will feature a covered area that will hold two picnic tables. A trellis, made of 150-year-old oak from the house, still bears nail holes. Made by Lawrence Gray’s shop class at the Mason County Vocational Center, the trellis will be placed under a large tree on the property. Bricks from the former chimney will make a path leading to two marker signs. One sign panel will explain the former house and its architecture. The other will contain a biography of the historian. The park will also include a site for a gazebo, although it will not be in place at the park’s opening, due to a lack of funding, according to Lowell Wilks, Rivers to Ridges project coordinator. A water well will also be renovated at a later date. Many people and organizations have been working on the park, including members of an AmeriCorps team and Mason County Day Reporting participants. Monetary donations have been made, with Hogg & Zuspan donating building materials and Bob’s Market and Greenhouses providing excavation work and fill dirt. Jim Flook, Rivers to Ridges historian and AmeriCorps VISTA member, said the park being located next to the Mason Library is very fitting. Lewis is believed to have written both “History and Government of West Virginia” and “History of West Virginia in Two Parts” in a two-room office/study on the Mason property. Flook said Lewis used his personal library as the town’s library, where residents could come and borrow books from him. The park property is owned by the Mason County Commission. Once the park is completed, however, it will be maintained by the Town of Mason. The park is expected to be used frequently by the Mason Library. Story hour and summer reading participants will use it for outdoor activities, and the public will be encouraged to take advantage of the park, as well. Donations are still being accepted to complete the park, construct the gazebo, and renovate the water well. Monetary contributions, designated to the “Virgil A. Lewis Memorial Reading Park,” can be mailed to the Mason County Library Board, P.O. Box 609, Mason, WV 25260.